It features a unique shape. This vessel set is designed to be installed as a above counter vessel set. It is constructed with ceramic. This vessel set comes with a enamel glaze finish in White color. It is designed for a deck mount faucet. Simple and clean above counter white ceramic vessel. Premium white glaze for a glossy finish. Kiln dried ceramic construction. Smooth non-porous surface prevents from discoloration and fading. Completely finished from all sides including back. Can be used with a deck mount faucet installation. Pop-up drain assembly without overflow. Double fired and glazed for durability and stain resistance. Quality control approved in Canada. 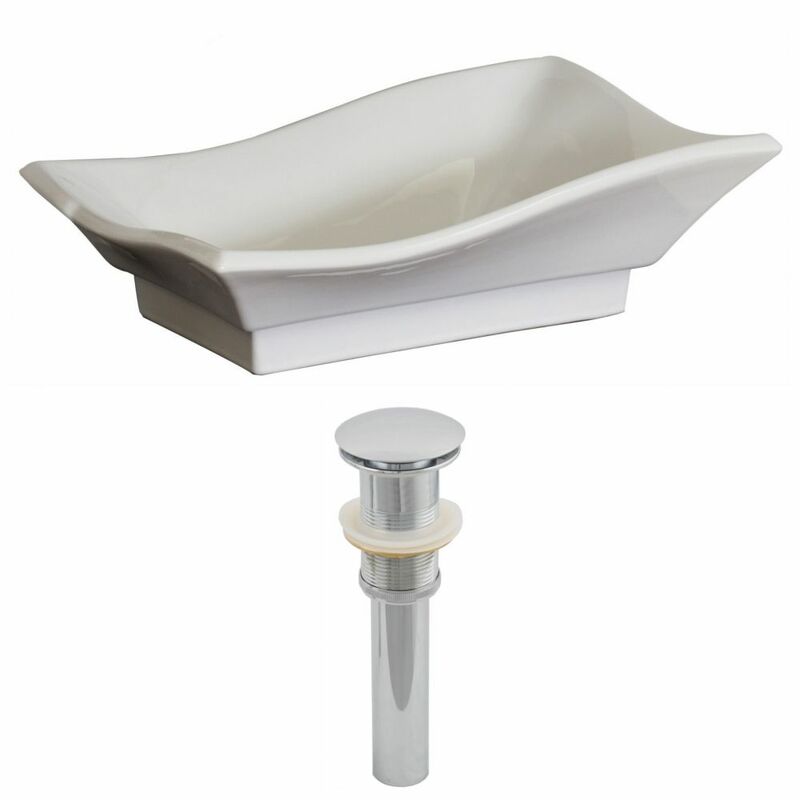 Drain features a high quality solid brass construction ensuring durability. Re-inspected prior to shipping your order. It features a round shape. This undermount sink set is designed to be installed as a undermount undermount sink set. It is constructed with ceramic. This undermount sink set comes with a enamel glaze finish in Biscuit colour. This transitional undermount sink set product is CUPC certified. It is designed for a 3h8-in faucet. It features a oval shape. This undermount sink set is designed to be installed as a undermount undermount sink set. It is constructed with ceramic. This undermount sink set comes with a enamel glaze finish in Biscuit color. This transitional undermount sink set product is CUPC certified. It is designed for a deck mount faucet. The Avanity 18 in. square vitreous china vessel sink offers timeless durability and everyday functionality. Polished interior is easy to clean and maintain. It is designed to install above the counter. Bring functionality and classic KOHLER styling to your workspace with the Bannon service sink. This deep, single-basin sink is constructed of KOHLER Cast Iron for years of reliable performance, and includes a rim guard for added durability. This model features a two-hole drilling on the backsplash for faucets with 8" centers. 20-inch W x 14-inch D Vessel Sink in White with Drain It features a unique shape. This vessel set is designed to be installed as a above counter vessel set. It is constructed with ceramic. This vessel set comes with a enamel glaze finish in White color. It is designed for a deck mount faucet. 20-inch W x 14-inch D Vessel Sink in White with Drain is rated 5.0 out of 5 by 1.